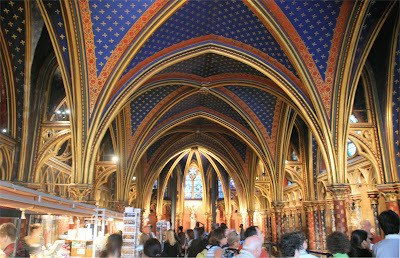 Having returned late Thursday night by plane from Biarritz, we decided to visit Sainte-Chapelle on Friday, with my sister and her family due to arrive Friday night by car. Friday was a beautiful early Fall day with clear skies and temperature in the mid-70s. We ate lunch at The Horse's Tavern, a popular cafe just north of The Odeon Theatre and the Luxembourg Gardens. It's an easy 10 minute walk from our apartment. We visited St Sulpice two blocks away, then stopped by the main headquarters of the fire department (sapeur pompiers) to buy a t-shirt for Zachary and a friend back home who is a fireman. 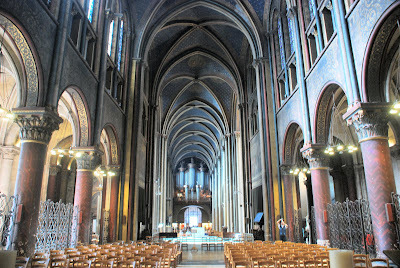 Then up to Saint-Germain-des-Prés where we visited the "modest" 6th Century (!) Church of Saint-Germain-des-Prés right on the main square across from Les Deux Magots, where we were planning on dinner with my sister and her family later that night. If you were just driving around Paris, you probably wouldn't give this church a second glance. It was only in reading about it later -- one of the great benefits of blogging is that it forces you to learn about what you are writing about! -- that I discovered that it was so old and also encompassed a much larger land area as an Benedictine Abbey before all but the church were largely destroyed around the French Revolution (as so many structures were, unfortunately). It has a significant and fascinating role in the development of Paris. Now that I know a little more about it, I need to return. René Descartes, the famous philospher whom a nearby medical school is named after, is buried in a side chapel. This is the inside of the church looking back to the pipe organ over the entrance. We continued our walk towards the river, stopping briefly to show Amanda the Serge Gainsbourg house, and then crossed over the Pont Neuf bridge, which ironically means "New Bridge" despite being the oldest standing bridge in Paris. 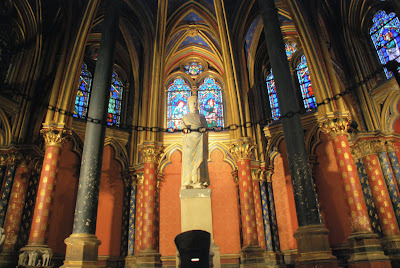 Saint-Chapelle is a gothic chapel located within the walls of the Palace of Justice (Palais de Justice), which is the former royal palace of Louis IX (aka "Saint Louis") in the 13th Century who commissioned the building of Sainte-Chapelle to house Christian relics. 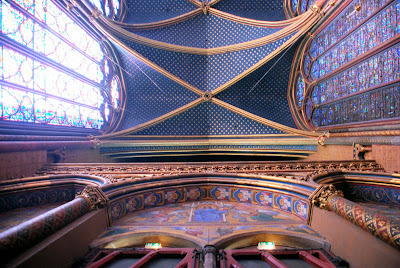 Because it lies in the courtyard of the current massive "Ministry of Justice," it is difficult to see Sainte-Chapelle, except from inside the courtyard. This is illustrated by the following two images. 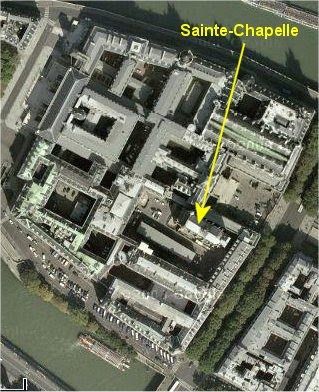 The first is a satellite image fully contained by the Palais de Justice complex with an arrow pointing to Sainte-Chapelle. 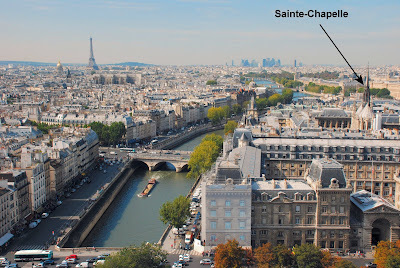 The second is a picture taken from the top of Notre Dame (also on Ile de la Cite to the east of Sainte Chapelle) which illustrates how you can really only see the spire of the chapel above the walls of the palace. To enter the courtyard, you must pass through an x-ray conveyor belt and metal detectors just like you are boarding an aircraft. Once through security, you also must pay 8 Euros to gain access to the chapel. For an additional fee, you can visit the Conciergerie, the former prison famous for housing Marie Antoinette (among others) during the French Revolution. The chapel itself is relatively small, measuring 36 m (118 ft) long, 17 m (56 ft) wide, and 42.5 m (139 ft) high on the outside. It has two levels. The lower level, formerly the parish church, now houses a gift shop and includes a statue of Saint Louis at the front. It has relatively low ceilings at 23 feet and has a very intimate feeling. As is apparently standard in these old churches, you access the upper levels by way of claustrophobia-inducing spiral steps. Fortunately, compared to Sacre Coeur or Notre Dame, this is a short walk to the upper chapel, which is the star attraction. Only 100 feet long, 67 feet high, and 34 feet wide (note the 3:2:1 ratio), it reminded me of being in the Sistine Chapel in Rome (134'L x 44'W x 68'H) except slightly smaller and with Michaelangelo's frescos replaced by stained glass windows (the surface area of the stained glass is about half that of the frescos, but the frescos were also on the ceiling). Indeed, the sense of "vertical" is accentuated by the 15 fifty-feet high windows encircling the chapel. Unfortunately, the chapel is still undergoing restoration of the stained glass. The right (south) side has been completed (I assume it was done first because it is the side facing the sun during the day) and they are just finishing the front but have yet to start the left side. Note the difference in the clarity of the stained glass between the two sides. This is the view from the front looking towards the back of the chapel with the famous "Rose Window" at the top of the back wall (added a few hundred years later). The people sitting on the benches along both sides give you a good sense of the small scale of the chapel. For a more unusual wide angle that illustrates the "before" and "after" of the renovation work, I set my camera on the floor towards the back under the Rose Window and shot the ceiling. 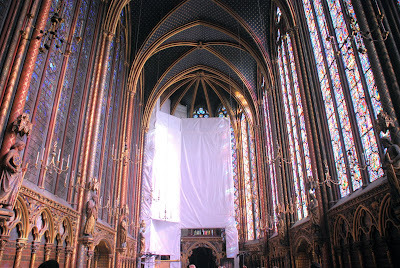 Much of the chapel was damaged during the French Revolution (again!) although the current structure is a faithful recreation and 2/3 of the stained glass is original. 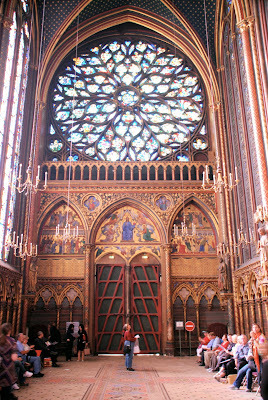 Saint Louis built Sainte-Chapelle to house the Holy Crown, a fragment of the True Cross and other relics he had acquired from Baldwin II of Constantinople. This made the chapel itself an immense reliquary, housing the crown, the True Cross fragment, relics of the Virgin Mary, the Holy Lance, the Holy Sponge and the Mandylion, a supposed image of Christ. After the revolution, many of the relics were dispersed but some remain in the treasury of Notre Dame and are displayed on the first Wednesday of each month. Hmmmm.... that would be next Wednesday.